Overview: Any cyclist wanting to get from the northern half of Portugal to the Alentejo (or vice-versa) has a big problem to face – Lisbon! Although Portugal’s capital city has definite attractions, it’s not the most pleasant place for cycling – and there are limited options for crossing the Tejo river. 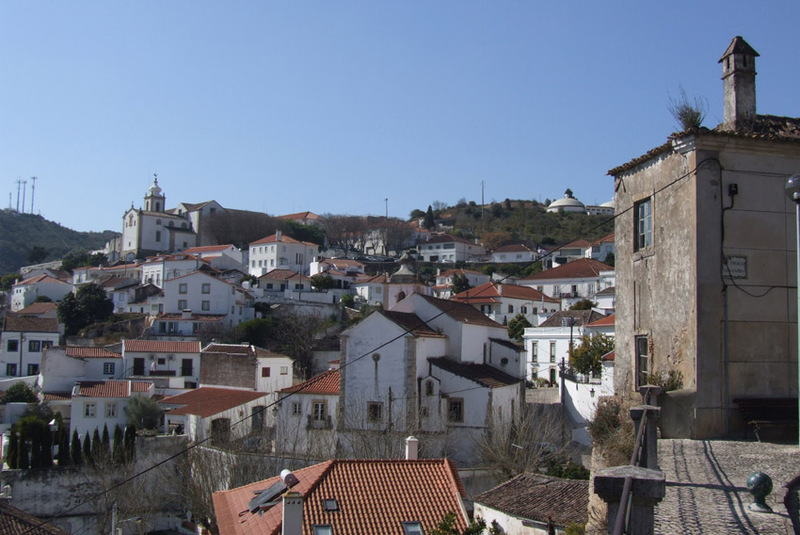 This route gives you a fairly quiet, mostly scenic route to connect Peniche on the Atlantic coast with Évora and the Alentejo. For those coming north, even if you’re not interested in the seaside you can also use this route to connect with some of the other historic towns in central Portugal like Alcobaça, Batalha and Óbidos. Distance & Difficulty: Overall distance of just over 200km /125 miles. The northern end of this route is reasonably hilly but nothing too major. Coming south from Bombarral, there’s a bit of a climb over the Serra da Montejunto but there are no really severe inclines. The plus point is that there’s not generally too much traffic and you’re riding through attractive countryside with some excellent views! The easiest route from Alenquer would be down into the Tejo valley and then south to Vila Franca but this is all quite built up, busy and not very attractive. Instead, the route shown takes you on hillier but much more pleasant back roads that drop you down almost right to the bridge over the Rio Tejo. When you reach the Tejo, the route crosses the river on the N10. This can be pretty busy but there is a narrow path for cyclists/pedestrians behind a safety barrier. The section between the Tejo and Porto Alto is fairly flat and boring. However, there is a reasonable shoulder on most of this road and as you head south and west towards the Alentejo the landscape gets progressively quieter and more interesting. Beyond Montemor-o-Novo the route takes you back onto minor roads again – with an opportunity for a detour to Os Almendres, the largest prehistoric stone circle on the Iberian peninsula. Stages: You’ll probably want to split this up into two or three days. Logical stops would be Alenquer and either Vendas Novas or Montemor-o-Novo. Coming south it’s just over 65km to Alenquer – which would also be the toughest part of the ride. Continuing on, the riding is mostly flat or gently rolling. From Alenquer it’s about another 70km to Vendas Novas or just over 100km to Montemor. Vendas Novas might seem a more logical place to split the journey but Montemor is probably a more attractive stop – and has an interesting castle to explore. From Montemor it’s about another 34km to Évora. If you wanted to do the whole thing in two days, Vila Franca de Xira would make a logical stop around the halfway mark. However, apart from being on the railway line to Lisbon, it’s very built up around here and not particularly appealing. Accommodation & Provisions: There are plenty of small villages along the way between Peniche and Vila Franca for cafe stops etc. You’ll be able to find supermarkets in Peniche, Bombarral, Alenquer and around Vila Franca. Things will be a lot quieter south of the Tejo but you should be able to get supplies in Porto Alto, Vendas Novas and Montemor. With accommodation, you’ll be able to find campsites and a range of other accommodation in both Peniche and Évora. Alenquer is smaller and the nearest campsites are out of town to the north. Otherwise you should be able to find guesthouses etc in any of the towns mentioned as possible stops.